Regardless which type of media you prefer or are interested in, we supplie to you the typical cases and boxes and of course the fitting printing matters. You can be sure, that you will get the DVD Inlays, Booklets, CD Covers, Folder or Poster ready folded and packed. Benefit from our services from a single provider. 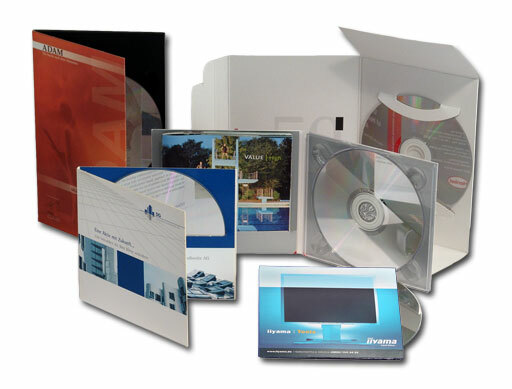 Our print partners are specialized in media packaging following industrial standards. We pass fair conditions on to you. Print products with only one side color print (4/0) or a black/white backside (4/1) costs less than the same product in full coloured print (4/4). And in small series we advice booklets and inlays in high quality digital print. Our Offers show the most essential and wanted and best selling products. But also special requirements will be fullfilled readily! Do you need more information about pre press stage? You want to have made the Artwork by our grahic services? Or do you search for the exact spezification for your printing matters? The packaging of the media products in the ordered sleeve or foil is mostly included in the price for the boxes. In individual cases, especially for expensive cardboard sleeves (digipaks, vinyl-bags etc. ), the work will be done manually. Similarly in case of repackaging. While the most of plastic boxes can be cellophaned in the machinery cardboard packagings must be shrink-wrapped in a thin foil (Schrumpfung, shrinking).